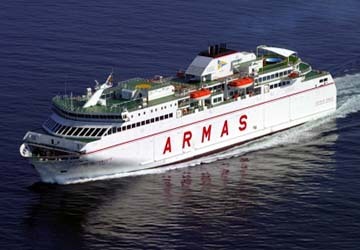 This ship is no longer operated by Naviera Armas and is now with Naviera Armas. First put into service on the first of April 2004, Volcan de Tamasite has elevated into one of Naviera Armas' most popular vessels. The ship covers the routes from Granada to Morocco in the summer, proving to be one of the most comfortable and leisurely modes of transport between Europe and Africa. In the winter, the sailing crosses between Gran Canaria and Fuertenventura. The ferry route can accommodate many passengers; stretching to 143 metres in length and with a beam covering just over 24 metres, the boat is one of the largest belonging to the fleet. Large halls of armchairs decorate much of the interior, perfect for whiling away the journey, feeling the waves rock you slowly back and forth. To really indulge yourself in a stint of relaxation, hammock areas are filled with passengers enjoying a quick snooze or losing themselves in an engrossing book. For the longer sailings, comfortable bedding is available to catch a good night's sleep. A cafeteria is open throughout the entirety of the crossing, supplying a vast selection of fresh produce and sweet/savoury snacks. For a more nourishing meal, a restaurant/bar area is open at certain times, and a self service system is perfect at breakfast, lunch and dinner. Duty free shops are a haven for anyone who loves scouring for a wholesale bargain; cigarettes, food and cologne are popular items for ardent shoppers, whilst some outlets supply clothing and gift items. WiFi is available onboard, an ideal addition for anyone who wants to keep in touch with friends/family or finish that final bit of work. In the summer, an outdoor pool is open with a poolside bar, welcoming passengers of all ages. Highchairs are supplied in the restaurant and self service areas to ensure children can eat their meal in a safe environment. Also, a children's play area is on board to keep your kids occupied whilst they sail the seas. Elevators transport passengers from the garages to the various levels, as well as travelling between decks. Please Note: Whilst we have taken great care in making our Volcan de Tamasite guide as accurate as possible, onboard facilities, services and entertainment may vary depending on the date and time of year that you travel, facilities mentioned may change without notification and ferry companies reserve the right to operate vessels other than those mentioned at time of booking without prior notification.